A s I walk around the streets of Rome (!! ), I can’t help but feel an urge to thank Out of Print for producing such wearable tote bags. Rather than lugging around a shoulder bag, these light weight totes combine two of my favorite things: convenience aaaand READING! I hate to be bogged down by heavy things, especially when my bag outweighs the goods I’m carrying. I tried to stick to the essentials for my first day in this beautiful city– a wallet, sunglasses and necessary orientation paperwork. 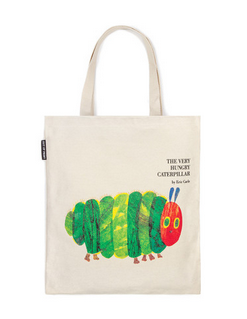 My tote, modeled after Eric Carle’s The Very Hungry Caterpillar, was perfect for a day like today. Hot, frantic and a little overwhelming. Each tote bag has the cover of a classic novel or children’s book on the cover. For big readers, or comfort-seekers, Out of Print is the place to buy from. And, big selling point, they’re eighteen dollars and incredibly durable. Now is not the time for me to order any American products, apparently there’s a customs fee? !, but for those who can, do it, do it, do it! For me!